Description: Digitization provided by the USF Libraries Digitization Center. Rare Maps. 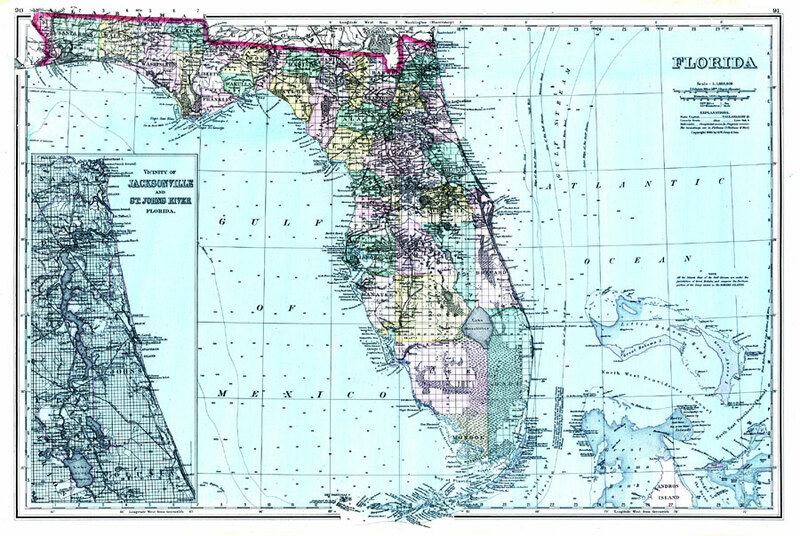 This is a detailed map of Florida showing counties, cities, roads, railroads, inland waters, etc with an inset of the Plan of the Florida Keys. Prime Meridians: Greenwich and Washington. Township and range grid established from the Tallahassee baseline and meridian shows the extent of land survey in Florida and the fact that much of the Everglades and the Forbes Purchase or Forbes Grant in northern Florida were not surveyed in 1886. The map shows lighthouses with visibility range in miles, the near-shore 100 fathom line, and extensive notes on the Gulf Stream including the cold wall edges of the stream and the warm bands, and velocity rates. Inset map of the vicinity of Jacksonville and the St. Johns River includes Fernandina and much of Nassau County south to Lake George in Marion and Volusia counties. Map scale is 1:1,800,000.